I have a secret. I've been thread tracing. Thread tracing is that method of marking the seam line on a pattern piece, that is, marking the actual sewing line of a garment with a hand sewn running stitch before the pattern piece is cut out. Some people think it's a tedious process, but it moves along rather quickly and efficiently with sweater knits; there are big spaces between the fibers to push your needle through. I think thread tracing is magic. It makes the sewing line visible on both sides of the pattern piece. Thread tracing may even act a little like stay stitching for unstable sweater knits, preventing unwanted stretching along the edges. Why does marking the sewing line matter when I'm going to use the same seam allowance throughout? Why not just use those handy seam allowance guides on the serger or sewing machine to guide me? Or why not just mark the sewing line on the wrong side of the fabric like this (second pic)? Well, I've done all those things in the past, and I'll continue doing so for certain quick makes and accessories. But when I want an easy way to match a textural or color pattern at the seams, or if I want to prevent a sloppy fit from happening because my fabric seems destined for stretched out or frayed edges, I'll thread trace around the paper pattern pieces before removing them from the fabric. (For open work fabrics, I still recommend paint on temporary stabilization, perhaps with thread tracing now?) I might be thread marking all the notches and other marks too. We'll see. How to make a well sewn sweater is what I'm exploring and practicing. Thread tracing is becoming one of my essential steps. Though the book does not mention sweater knits, it was only after reading Couture Sewing: The Couture Cardigan Jacket, Sewing secrets from a Chanel Collector that I started trying the technique. Because I'm working with a knit, as opposed to the woven fabrics in the book, I'm tweaking the method a bit. Amazingly the process seems faster and easier than I recall it being the one time I tried it with a woven fabric many years ago. For sweater knits, I'm using a blunt end, large eye needle, and 20/2 mercerized cotton yarn. The stitches are easy to remove. When I'm happy with my process, I'll post my notes. 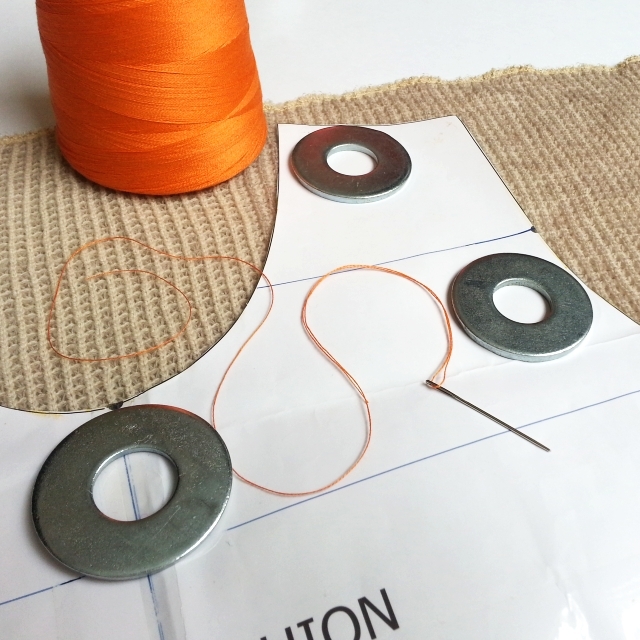 Have you ever used thread tracing when constructing a garment? How did you like it?